When you cross the ford, park your car and walk toward the Barn, you're greeted with acres of sprawling gardens, majestic trees and historic stone buildings. Every season reveals Lavandula Farm in a different light: autumn turns the leaves ruby and gold; winter brings rain that fills the creek; spring delivers an endless chorus of flowers and birdsong; and summer is all about lavender. European style gardens were planted out to frame and meander around the original stone buildings. Lavandula's festivals continue the Swiss Italian tradition of welcoming the seasons with song, dance and Italian food amongst great family and friends. 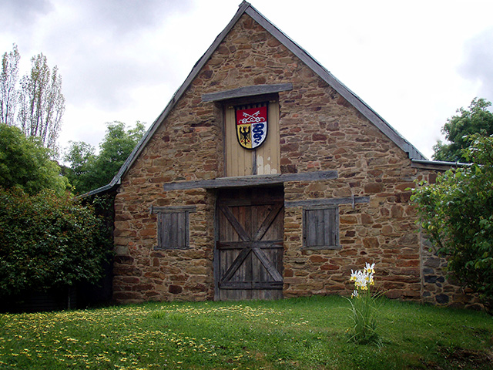 Or, join one of the tours of the original stone farmhouse. The original 1850s golden stone buildings emerge from amongst European-style gardens that freely ramble almost as far as the eye can see. The aroma of our wood-fired oven will help lead you to rolling lawns where performers celebrate the new seasons. La Primavera, Harvest Festival $6 and $2 children. Annual Rainfall avg: 831mm. Summer avg. 139mm. No. of rainy days: 58 Winter avg. 281mm. The farm was originally operated by a Swiss-Italian family, who came here in search of gold but stayed to farm. The Tinetti's ran their dairy farm from 1860 until about 1975. In the late 1980s, Carol White restored the crumbling buildings and planted out European-style gardens. Every day at 12 noon, 2 pm and 4 pm there are free tours of the original stone farmhouse. 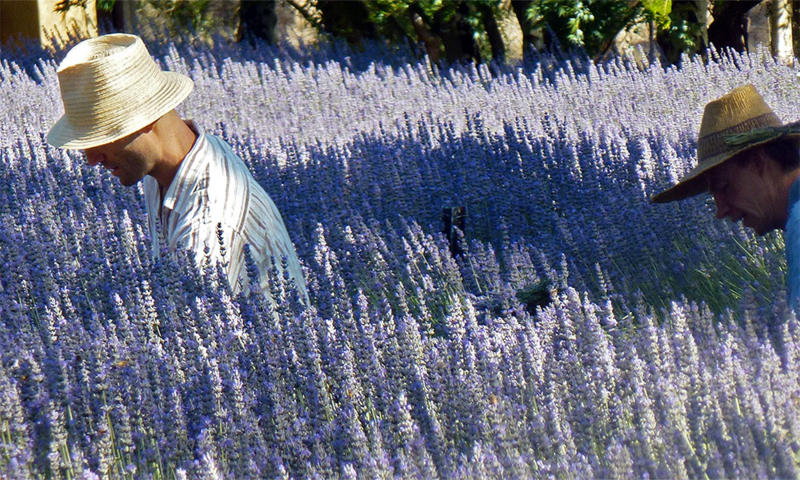 From late December, the lavender begins to flower and throughout January we hand-harvest the crop. From the field, the lavender is hung to dry for use as bunches or winnowed for its precious flowers and seeds for potpourri. 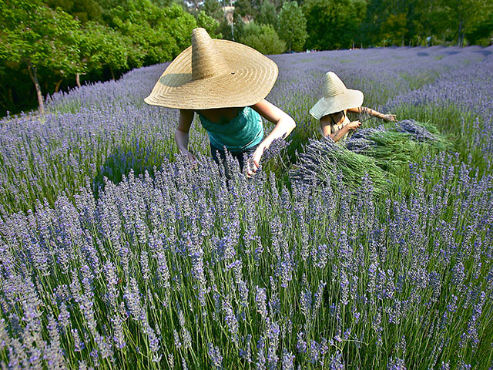 Lavender is distilled for its floral water and essential oil. 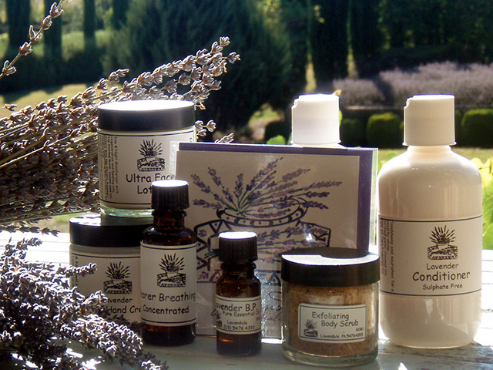 We make a wide range of lavender products right here on the farm. Our gift shop carries a huge range of products made right here on the farm from lavender hand creams to lavender room mists. You can be assured of the finest quality because the raw materials come straight from our own fields to be processed. You can either visit us or go to our online shop. 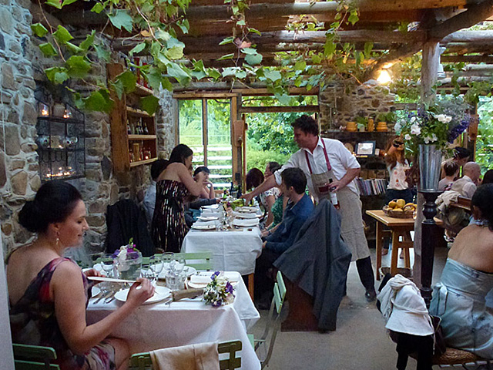 Eat outdoors under the ash trees, in the snug timber room or in the stone loggia. The style is based on the grotto of Ticino (in southern Switzerland, a simple local caf serving an antipasto platter and local wine). The menu is seasonal and explores European cuisine. You can have frittata, soup, or a full meal. We make our own scones, biscuits, cakes, and preserves. Or you can purchase Lavandula's own lavender cordial or lavender honey. We're fully licensed and carry a wide selection of local wines, beers and ciders. Why not try our house specialty: lavender champagne. Fabulous beautiful old buildings and history of original creators of this magical farm. Tour definately recommended. Must see.